In honor of my daughter's birthday yesterday, I decided to join in on Round Robin hosted by Amy @ Keeping up with the Schultz Family. I am going to share with you GG's birthday cake from last year. She's We're still deciding what to make for her party this weekend, but I'm sure once we figure it out, I'll post pics of that, too. I think we're shooting for a hockey cake - wish me luck with that! She wanted a Candy Land cake. 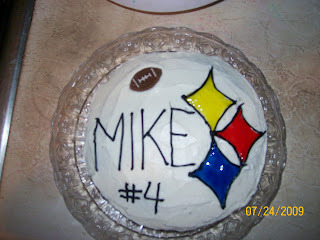 I think it was the sweetest cake EVER!!! And I don't mean sweet as in really cool, I mean sweet as in a free pass straight to the dentist! But we had fun making it together. 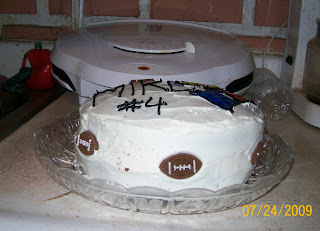 We used a box of confetti cake mix (I don't bake so Betty Crocker is a good friend of mine!). To make the green icing, we mixed green food coloring with white icing. The path to the end is made up of Starbursts. We have our M&M forest at the beginning followed by the gumdrop field. Complete with the gumdrop path. I used licorice bites for the licorice forest and Laffy Taffy for another secret path. In the top left corner, you can see the lollipop forest and if you wanted to bypass that (assuming you could actually play on the cake) you could travel over the path of pink Nerds. The "castle" at the end is made of Smarties and vanilla Tootsie Rolls. The 3 black dots along the path are "lose a turn" squares and those are chocolate chips stuck on there with some icing. The hardest part of making this cake was stopping my kids from eating the pieces making sure everything stayed where is was supposed to and didn't fall over. Like I said, we had a blast making this cake and really enjoyed eating it, even though my teeth hurt for a week afterwards! take my advice and buy your supplies during football season. 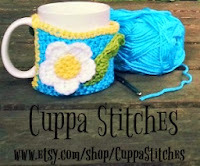 Thanks for letting me share! 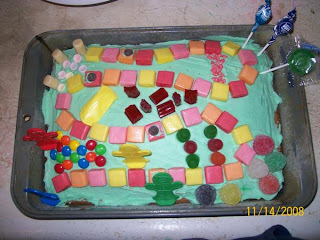 I hope you enjoyed and maybe you could even give a board game cake a try yourself! Just make sure you call your dentist ahead of time and give them a heads up that you'll be stopping in after the party! Wow what talent you have. That was amazing. I love the candy land cake. That was one of my favorite games for sure. Thanks for playing along. Cute cakes! Love that Candy Land cake, that was one of my favorite games growing up, unfortunately Spencer doesn't have the same love for it as I did! 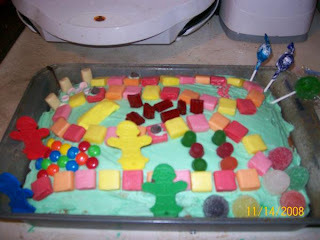 How clever you are with the Candy Land Cake! And just too funny about the free pass to the dentist! LOL! You are just so creative! Your kids must have been smiling ear to ear! Oh hell, that first cake woulda set my alarm bellsaringin! So cute but so SWEET! How cute is that candy cake, nice job! How cute! Fortunately for me, I have a friend who is talented at making cakes, otherwise, my boys would get sheet cakes from the grocery store, as this is not my talent! I LOVE the Candy Land cake. How awesome! The CandyLand cake is adorable! These cakes are totally awesome. I need you to do mine.